So on the weekend I attended the introductory permaculture course in Mikkeli and it was indeed interesting. The way of thinking in permaculture, I realized, is something that relates to how I already think of the world, but I did get some tips I will try out in the garden, which was mainly why I wanted to attend the course in the first place. A method of design,which help create sustainable environments both for nature and humans. Basically a circular economy system are drawn from similar ideas and principles as permaculture, also transition towns try to design sustainable cities or towns for people with similar ideas in mind. The transition town idea of how to organize people is one of the ideas of permaculture as well, that you need to include the human into your design and think about designing for strong social sustainability, keeping in mind that the economic and agricultural systems we have now are not very sustainable in the long run. During the course we saw the movie Rebecca's farm which deals with the question of how will today's farms, so dependent on oil, survive in the future. Modelling a sustainable social network during the course. Going back from the big picture to the own garden perspective though, it is not difficult to try to apply the principles in your own garden and it is a good "small scale" place to start and experiment. 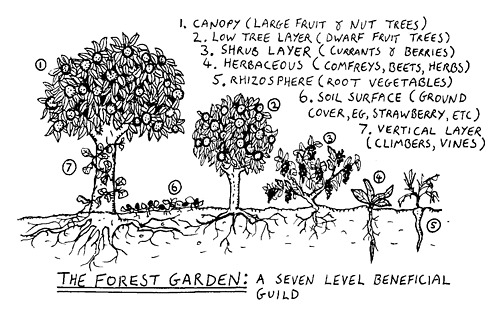 We talked amount other things about creating forest gardens, plant guilds and other tips and tricks for the best edible gardens. I hope that next summer I will be able to try out combining some plants to make a plant guild and perhaps try to landscape the part of our garden that is mostly forest to see if I can try to make it a bit more "organized" and plant some new stuff there too. Luckily now I have the whole winter to make wild plans, plans are good, then hopefully at least some of them come true. My course was only a weekend introductory course to permaculture at Otavan Opisto, but price/quality was really good, so I do recommend it (it was in Finnish though). There is every now and then Permaculture Design Certifications courses that are about 2 weeks long if you are interested in taking a longer course. A few places you can also do a PDC course online but I realised that for me the online course didn't work out. If you want to travel and combine some organic farming and learning, try out WWOOF:ing, some of these farms are permaculture farms we well as organic.